And again happy birthday my friend. Happy Birthday, Dear Mr. Mclaughlin! Wish you happiness!Great thank you for you music and way of living which both inspirate constantly. john, this should tickle your memory pads……..remember play8ing at a high school in flemington nj in the early 70s ????? i helped get you booked to play the hunterdon central high school….in the new field house gymnasium when it was first built, in i think it was 1971 or 2. that was 40 yrs ago, wow….and i am still a big fan….!! would love to hear from you, should you want to reminisce the 70s. i convinced the school board to allow youto play there because it was orchestra music, hahaha….well, hey, it was.,…plus oh so much more. whatta great concert… i sat stage side, it was amazing. I was there! I also saw Mahavishnu Orch. in Princeton and Boulder CO! Bon anniversaire à celui dont la musique accompagne ma vie depuis toujours. Longue vie à toi, John! Happy Birthday and thanks for en phenomenal 2012! Keep up the good work and may 2013 bring many great musical moments! I wish you a very happy birthday and a succesful and healthy 2013. Just go on your own way, please, we always support you. HAPPY BIRTHDAY DEAR JOHN!!! AND MUCH MUCH MORE YEARS OF YOUR GREAT INSPIRATION,ALL THE BEST FROM MEXICO CITY!! Have a blessed and wonderful year ahead. Happy Birthday. Thank you so much for your music – it has been such an important part of my life. God bless. Happy Birthday, dear John! I wish you health, happiness and inspiration! Thank you for the love and dedication with which you treat your creativity. We feel it! Happy Birthday, I wish you a long and fruitful life, for your music will undoutebly live forever. An exceptional musical and spiritual influence, I was very happy to finally see you live in Leverkusen this year. Many great returns! Happy Birthday Dear Mr.McLaughlin!I wish you the power you need to make you dreams come true! Best wishes John! Again, I thank you, Selvaganesh, Mahadevan, Zakir, and Srinivas for the most important event, political or musical, of 2012. I refer of course to the concert in Palestine. To your birthday all my best wishes. Since 1971 i listen to your music and want to thank you for that. Wishing you a day and year filled with as much joy and happiness as your music has brought to people all over the world!! Wishing you the happiest of Birthdays toaday! !Thank you for all the great music over the years and look forward to more!When you were born the heavens played a beautiful song!!! Happy birthday John, can’t wait for new music.Thanks for the music you have given to us. Happy 71st birthday John! Another year of thanks and grateful appreciation to you from all the people in the world that love true music from the heart, mind and soul, whether we look to the past, present or the future, your Spirit brings us joy and connects us to the great Presence That Can’t Be Named! Happy Birthday! You are an inspirational Being! Happy Birthday Maestro John! Thank you for all the music and life you’ve shared with us as of yet, and may you have many more blessed years to share with family and with us too! Hoping you can come back to Southern California soon! From one 1942 guy to another!! Joyeux Anniversaire John, je te souhaite une longue vie. je rêve un jour de te rencontrer, tu as été ma plus grande influence. Merci pour tous ces merveilleux albums et tes compositions donc certaines sont magnifiques. THANK YOU SO MUCH FOR YOUR BLESSINGS FOR MANKIND, YOUR HERITAGE, YOUR WHOLE BEEING. Happy Birthday John ! GOD bless you now and forever ! Thank you for all inspiration and great music. Let the inner flame keep burning a long time! Best wishes for bliss and joy in the future.. Happy Birthday……..Our Dear John Mclaughlin Ji !!! Infinite Love and Power to you Brother!!!! Happy Birthday and thanks for your great contributions to music! Thank you, for all your years of Music Magic & Spiritual Inspiration. It is inspiring to know you & Carlos from Jamaica days. And to watch you & Carlos play music. Happy Birthday John! We met once in Austin through a mutual friend Al Di Meola. Cheers and thanks for all the great music and tutorials!! Happy BDay Maestro Mahavishnu John mcLaughlin 🙂 Loving & Respecting 4Ever. Wish you good health, good luck, happiness and many more of your beautiful musical adventures. Happy Birthday. I hope you have many, many more. Thanks for providing me with decades of utmost joy! Now, Here, This. And when the mind turns to disconcerting thoughts of « them », or « us », we return to Now…Here…This. I still can’t articulate the profound effect that « The Unbeliever » had on me. I was listening to it one winter night many years ago. Walking in the snow and rather high from some « organics » listening to The Unbeliever on a walkman…Nostalgia. Happy birthday John! You’re an inspiration and I’m looking forward to many more years of your musical genius. 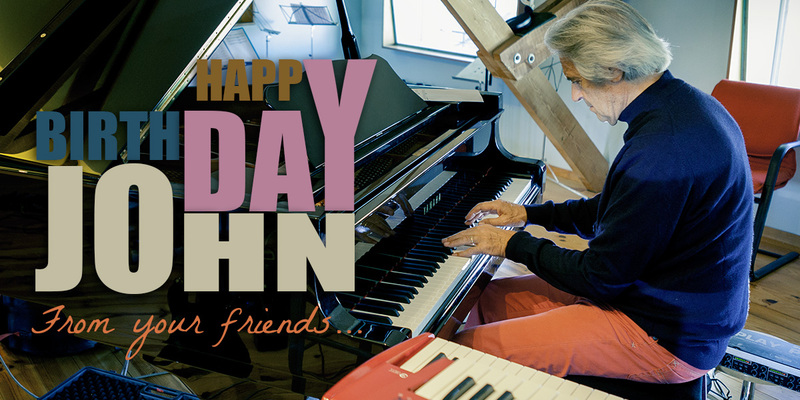 Dearest John wish you Happy lovely Birthday ! Thank you so much for the Musik and the Love! Happy Birthday John! I haven’t seen you in a long time.I hope you come to Arizona some time in the future.Meeting and talking to you in Denver the several times we have met over the years has been one of the Greatest, most inspirational experiences of my life! You were always so nice to me. Again, Happy Birthday and I wish you many more years of success. Dear John!Happy Birthday!Health to You at all times!Mental welfare.Boundless love everyone and everything! Happy Birthday! Wishing you good health and continued inspiration. Happy Birthday John! I love your new album and I sincerely hope you take your tour to America soon. I’m a guitar student in Chicago, IL and I would really love to hear you and your band play. Continued creativity my friend from Isle of Manure! The Heart of Things release incompareable to anything then and now. Happy Birthday John. May this year be a blessed year for you. Also thank you for sharing the music and your kind spirit. It is musicians like yourself that have influenced me and my life to become a professional musician myself. Now there are others like you on this life quest. Thank you for opening the door. I´m 24 and i´ve been tracking down your music ever since i was a teenager. It VASTLY enriched my musical vocabulary and my LIFE !! 17 ans de déprime mais je ne décourage pas. Merci pour ta musique et longue vie à vous deux !!!! Happy Birthday a little late, John. You have given me so very much happiness over all these years. I put on « Birds of Fire » and I have joy. I put on « Now Here This » and I have joy. And everything in between. Thank you so very much! I wanted to wish Mr. McLaughlin a Happy Birthday. I have been listening to his music for many years. Belated Happy Birthday John. Your music has meant a lot to me over the years – especially with Shakti. BTW Friends and family still argue about where you were born in Doncaster (as I was). I was born in a one street « village » called Sunnyside, 4 miles from Donny. Then there were fields on all sides – wonderful for kids. Anyway, were you born there; we would love to know. Thanks. Well John, in honor of your birthday I bought myself a belated gift! Yes indeed, I received my Inner Mounting Flame pen. ACME subsequently sent me a video with you discussing the pen. Delighted to hear that proceeds of the sale will go to Ramallah. Happy Birthday John, Your music has affected me deeply over the years. We all are so grateful for how your music has touched our lives. Anticipating seeing you guys when you come to Los Angeles. Love the new record, insanely deep, the inspiration never stops. Happy Birthday John! We need you here in Minneapolis at the Dakota soon! HAPPY BIRTHDAY!! I´m enjoying all your stuff. I´d like to have a new acoustic record from John!! I’ve been a fan since Extrapolation.You were way out ahead then and on the latest evidence you still are. Happy 70th John. Talking of 70….22Nov1970 Lifetime gig at the legendary Redcar Jazz Club. Ta for manfully signing my copy of Emergency whilst being battered by some typically appalling North East weather! John, I saw you at The New Universe concert in Raleigh, NC in November 2012 at The Lincoln Center, and got your autograph on a Strat pickguard, along with others. I told you the likes of your music could likely be heard in the Throneroom of God! You seemed to like that and we had a soul-brother hug – I will never forget! Long Live John McLaughlin! John glad you are doing so well. I have all your CD’s. Now Here This is great. Lately though I’ve been listening to Live At The Royal Festival Hall 1990 with Trilok and Kai. I really like the drum solo on Mother Tongues and the two harmonics you are playing. Great cover story in DownBeat by Bill. I’m just so glad that you have so much going on in the press,youtube.com, etc. Much better than back in the day of « Mediterranean » Concerto. Looking forward to the new studio release by Remember Shakti with L. Shankar on violin. Right? One of my favorite albums is Electric Dreams which I bought in Hamilton, Bermuda when I was 17. Thanks for letting your fans respond on this web site. Happy Birthday John, I am so pleased to be discovering your brilliant guitar playing and music, you are inspiring me to keep on with my own playing and music at 63 yrs old. My mum was born in Kirk Sandall she was 89 yrs in Dec- so it’s a good place to come from!. We lived in Q. M. Cresc. back in the 1960’s and it’s where I started guitar too. Thank-you very much for your inspirational technique and music. Keith. Happy Birthday, John. I hope you keep on making the incredible music that I am happy to say that I have been a fan of for almost 40 years. From, the original Mahavishnu Orchestra to Shakti and more… well lets just say that Ihope that your inspiration and genius are with us for many years to come. Thank you for all the great music and shows in and around NYC. Sorry I missed this year, it has been crazy for me. You are always a deep source of pure inspiration – not only for me – One thing that is quite easy to notice is that every single one of the brilliant and amazing musicians whom have played in your many, ever evolving, bands over the decades seem to have their most prolific performances with you, it’s like you seem to encourage all of them to really take their playing to uber-trans levels of inspiration and virtuosity. It’s always amazing. Best wishes and much love. Albeit belated– Happy Birthday to you, John… May your health never falter, and may those you care about enjoy the same. May your desire and love for music continue to fuel your creative output; I dearly hope to meet you one day. Belated Happy Birthday John! I’m an old fan since the early seventies and as a guitar player I can’t wait to hear your new disc. Continued health and success. God Bless! A Very Happy (belated) Birthday John. I send this late, since i visit for the first time. Such a great joy to see images of the music you have given us over the years. A wonderful website illustrating your truly great offerings to the Lotus Feet. Also, id like to mention briefly, that following your info on the Fishman midi, i visited a site with info on Andras Salay. Also featured was a young guitarist Bence Bécsy from somewhere in Hungary. Im no expert but he may walk in the footsteps of a great to be great. Dear John, a very happy belated birthday wish to you from me here in South Africa. I would realy like to correspond with you – so I am hoping that you will repy to my message. I recall hearing it after its release, in 1971, but never caught up to it till recently. It is truly a revelation. I cannot wait to hear the band at the Toronto Jazz Festival on June 23.
please add me to email notification of comment followups. john, this should tickle your memory pads……..remember playing at a high school in flemington nj in the early 70s ????? Thank you for penetrating this thick head of mine and moving my body and soul in ways that no one ever could. As long as I am alive I will be grateful to you for opening the door to so much more than I ever would have had in your absence. Namaste.